MapTun Performance is proud to present our new set of coilovers in a line of products in our new XT-Series. 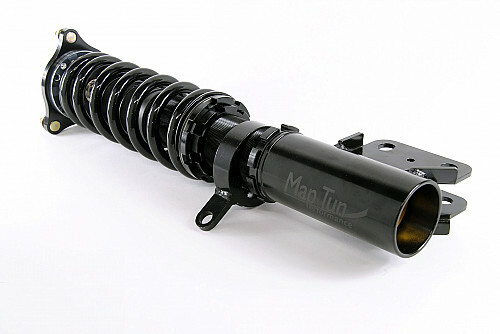 This Coilover kit is a high quality kit suitable for both street driving and track driving. The dampers are of a mono tube type, simply explained that the damper has a larger inner piston and is stable for both high temperatures and long active driving. XT-Series Coilover kit is made of steel and aluminum whereas highly stressed components are made of steel for best durability. The Coilover kit comes with pillow ball upper mounts with adjustable camber plate for the front dampers. They are adjustable in 32 ways for difference dampening force. We´ve decided to make these kits in a discrete and elegant design to keep the OEM-look. Height adjustable between 20-100mm depending on the cars stock chassis. This Coilover kit does not come with a TÜV approval.